Fatigue is one of the most common symptoms in multiple sclerosis (MS), with a major impact on patients’ quality of life. Currently, treatment proceeds by trial and error with limited success, probably due to the presence of multiple different underlying mechanisms. Recent neuroscientific advances offer the potential to develop tools for differentiating these mechanisms in individual patients and ultimately provide a principled basis for treatment selection. However, development of these tools for differential diagnosis will require guidance by pathophysiological and cognitive theories that propose mechanisms which can be assessed in individual patients. 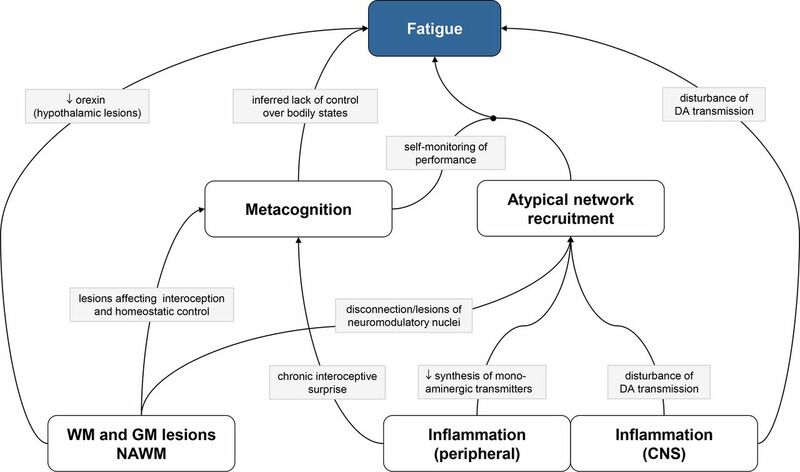 This article provides an overview of contemporary pathophysiological theories of fatigue in MS and discusses how the mechanisms they propose may become measurable with emerging technologies and thus lay a foundation for future personalised treatments. Multiple sclerosis (MS) is the most common neurological disease that causes disability in young adults (for recent reviews, see1–3). With an estimated prevalence of up to 83%, fatigue is one of the most common symptoms in MS4–6 and exerts the greatest impact on patients’ quality of life.4 7 Fatigue therefore represents one of the most pressing clinical problems in the management of MS. Beyond MS, fatigue represents a relevant symptom in numerous disorders from internal medicine, neurology and psychiatry.7–9 In general practice, 20% of patients complain of fatigue; this increases up to 50% in diseases involving the dysregulation of the immune system such as chronic infections, cancer or autoimmune diseases.10 It is also a frequently reported feature of psychiatric diseases and represents a core diagnostic criterion of depression in DSM-5. As for other neuropsychiatric symptoms, fatigue likely results from different underlying causes.7 10 At present, diagnostic tools are missing which differentiate, in individual patients, between alternative potential causes of fatigue. As a consequence, we lack a principled basis for treatment selection: while several pharmacological and physical therapies are used in practice—for example, drugs like amantadine11 or modafinil12 that affect glutamatergic and dopaminergic transmission and reuptake of monoaminergic transmitters, respectively—treatment selection proceeds by trial and error and under consideration of side effects, rather than by assessment of individual pathophysiological mechanisms. The current absence of objective clinical tests for differentiating alternative disease mechanisms constitutes a critical barrier to improving individual treatment decisions. Developing tools for differential diagnosis of fatigue in MS requires pathophysiological theories that propose mechanisms which can, in principle, be assessed in individual patients. Previous review articles (eg,10) have mostly treated fatigue as a clinical symptom across disorders. In this paper, we concentrate on MS and discuss possible pathophysiological mechanisms. Our review article provides an overview of contemporary theories of fatigue in MS and discusses how the mechanisms they propose may become measurable with emerging technologies, potentially leading to differential diagnosis and treatment predictions in the future. Initially, we briefly revisit the definition of fatigue and standard diagnostic procedures. This serves as a reminder that ‘fatigue’ is not a well-defined concept. This is not a trivial issue: one reason for the heterogeneity of the literature on fatigue is that past studies have assessed different constructs of fatigue, for example, not always distinguishing between the subjective perception of fatigue and externally observable fatigability of cognitive or motor functions. Pathophysiological mechanisms of fatigue discussed in this article. White and grey boxes represent classes of mechanisms and specific mechanisms, respectively; directed arrows and circle-ended arrows represent direct and mediating effects, respectively. Due to space limitations, only one mechanism per arrow is shown; see main text for other mechanisms. CNS, central nervous system; DA, dopamine; GM, grey matter; NAWM, normally appearing white matter; WM, white matter. Metacognition (self-monitoring) of interoception of dyshomeostatic states. MS is characterised by lesions in the CNS that are disseminated in space (eg, in the cerebrum, brainstem, spinal cord) and time (dynamic changes in lesion load). A key pathological feature of MS are WM lesions with demyelination and inflammation that lead to axonal damage and progressive degeneration.1 Additionally, GM lesions are present, resulting from cortical demyelination due to subpial inflammation, retrograde neuronal degeneration following axonal transection and degenerative mechanisms due to oxidative injury.19 Beyond demarcated lesions, the above processes induce diffuse damage of WM and GM that may lead to regional and whole-brain atrophy. Morphometric studies reported mixed results on the potential link between global measures of brain atrophy and fatigue20–22 and between local measures of WM/GM atrophy and fatigue,23–27 respectively. In the following, we discuss how different forms of WM and GM damage may play a role for the experience of fatigue. A general idea is that fatigue may result from global impairment of brain function due to distributed WM lesions.28 29 Several studies have used structural MRI and morphometric analyses of WM lesion load to test this idea. Across studies, the overall results are mixed: while some studies found a correlation between fatigue and global structural damage of WM,20 21 23 30 other studies failed to do so.31–34 This inconsistency may partially result from differences in methodology, for example, quantifying structural brain damage with different morphometric methods.35 An alternative explanation for variability across studies is that individual degrees of fatigue may be determined more by the locations of WM lesions than by global lesion load.24 36 Individual differences in normal-appearing white matter might additionally contribute to this variability.24 29 As a final factor of variability, there is an ongoing debate whether individual disease trajectories of MS may be driven differentially by inflammation and neurodegeneration37 38; such differences in disease mechanisms could also relate to differences in fatigue. A second explanation refers to structural disconnection, specifically disruption of communication between brain regions with functions of relevance for fatigue, such as motor planning and execution.45 46 Diffusion-weighted imaging studies demonstrated that WM changes are correlated with fatigue, particularly in the anterior internal capsule and anterior thalamic tract.23 24 28 29 47 48 Alternatively, WM damage could disconnect areas of importance for arousal and motivation.46 This is less well investigated, but a tractography study reported altered connectivity between posterior hypothalamus and mesencephalon,49 a tract thought to contain wakefulness-promoting ascending monoaminergic connexions. A third possibility of how GM lesions may cause fatigue refers to the frequent involvement of the brainstem in MS. Specifically, lesions of dopaminergic, serotonergic or noradrenergic nuclei in the brainstem and the consequent reduction of monoaminergic transmitter supply to cortex and basal ganglia could explain the reduction in motivation, mood and arousal that characterise fatigue. Following this brief overview of how peripheral inflammation may relate to the experience of fatigue, the question remains how inflammation inside the CNS might lead to fatigue. One possibility relates to dopamine: CNS inflammation triggers activation of microglia, and the ensuing production of cytokines in situ negatively affects dopaminergic transmission, for example, through direct effects on dopamine transporters and receptor function (for review, see10). This has motivated a view of fatigue as resulting from altered connectivity between striatum and prefrontal cortex.8 90 The efficacy of this connexion depends on dopaminergic meso-prefrontal afferents and has been implicated in reward-oriented learning and motivation.91 In brief, from this view, fatigue is conceptualised as a variation of altered response to reward and the ensuing decrease in motivation. One possible explanation for altered cortical activity in MS is that networks mediating specific cognitive operations are perturbed by one of the mechanisms described above, that is, WM/GM lesions or functional impairments due to inflammatory processes. In order to maintain cognitive performance despite lesion-induced or inflammation-induced loss of network function, compensatory recruitment of neuronal tissue may be needed, either in terms of additional regions not usually contributing to a particular task and/or in terms of unusually high levels of activation. Analogous findings have been obtained in other diseases with discrete lesions, such as stroke.101 Whatever the cause of altered cortical activity, the question remains how aberrant activity levels are linked to subjective experience of fatigue. One possibility is that the activation of ‘atypical’ and the compensatory (non-adapting) activation of ‘typical’ regions might be detected by self-monitoring mechanisms, a metacognitive perspective we discuss below. The disease theories discussed so far offer potential physiological mechanisms but do not explain how the subjective experience of fatigue might arise. A metacognitive perspective may provide a crucial bridge here. Metacognition corresponds to cognition about cognition, such as judging the accuracy of a perceptual decision.107 In cybernetic theories of brain function, metacognition is understood as ‘self-monitoring of one’s level of mastery in acting on the world… and can be seen as a high-level form of inference about one’s capacity for control’16 (figure 2). Three metacognitive mechanisms of fatigue have been proposed—with emphasis on (1) interoception, that is, the perception of bodily states, (2) network-level function and (3) perceived effort of movements, respectively. A coarse schematic overview of the inference–control–metacognition loop for bodily regulation (for details, see16). 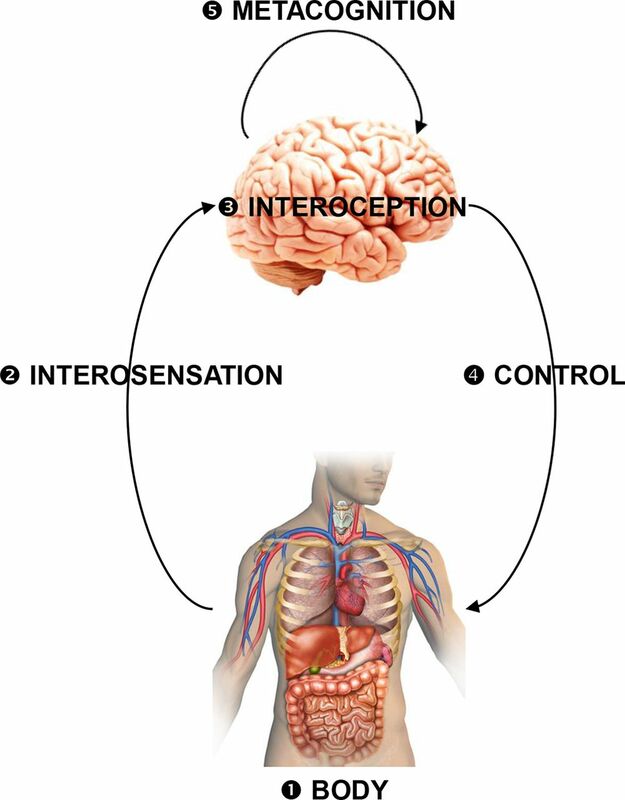 Interoceptive surprise as a possible computational substrate of fatigue can arise from perturbations of any components of this loop: (1) actual perturbations of bodily state that evade cerebral attempts of correction (eg, chronic inflammation, cancer); (2) altered interosensations (due to pathologies of interoceptors or afferent pathways); (3) disturbances of interoception (eg, inflammatory lesions of insula); (4) disturbances of interoactions (neuronally or endocrinologically mediated cerebral influences on bodily functions), for example, inflammatory lesions of ACC, brainstem, hypothalamus or their projections; (5) altered metacognitive processes (eg, changes in expected performance levels). The multiple failure loci offer a potential explanation for the clinical heterogeneity of fatigue and speaks to the necessity of developing tools for differential diagnostics at the circuit level. A clinically important corollary of this theory is that fatigue necessarily has very different causes. This is because interoceptive surprise can arise from disturbances of any component of the closed-loop relation between interoception, bodily regulation and metacognition16 (see figure 2). Notably, interoceptive surprise can result from merely perceived dyshomeostasis. This could occur when the cortical areas that infer bodily states are perturbed, for example, due to inflammatory lesions of the insula which are frequent in MS.19 The ensuing ‘illusion’ of dyshomeostasis would elicit misinformed interoactions, creating dyshomeostatic bodily states that reify the initially spurious interoceptive surprise and render it chronic. Similarly, primary disturbances of interoactions—for example, due to inflammatory lesions of visceromotor areas like ACC,19 hypothalamus62 or brainstem nuclei—would produce lasting perturbations of bodily states. Finally, a third proposed metacognitive mechanism of fatigue focuses exclusively on the sensorimotor system.15 This concept assumes that diminished sensory attenuation during the execution of movements would lead to proprioceptive prediction errors, requiring the brain to conclude that movements require more effort than predicted. Thus, here the emphasis is on fatigue as a direct consequence of unexpectedly high perceived effort during movements (proprioceptive surprise) as a cognitive cause of fatigue. A central question for this review is how fatigue-specific treatments could be personalised, given that fatigue in MS likely arises through multiple mechanisms (figure 1). In clinical practice, we are presently unable to differentiate between alternative causes of fatigue in individual patients. As a consequence, current treatment of fatigue is driven by trial and error and consideration of side effects. Treatment strategies for fatigue in MS include both pharmacological approaches (eg, the NMDA receptor antagonist amantadine, stimulants such as modafinil, or antidepressants) and non-pharmacological strategies (eg, mindfulness-based cognitive therapy (MBCT), cognitive-behavioural therapy or exercise) (for recent reviews, see118 119). Additionally, social factors, cognitive profiles and psychological traits modulate fatigue120 121; these may offer additional entry points for therapeutic interventions. In order to select treatments in a rational and predictive manner, novel clinical tests are needed. Importantly, these need to go beyond detecting fatigue; instead, they should inform the choice of patient-specific treatment—by enabling differential diagnosis of alternative mechanisms and/or predicting individual therapeutic response. Some of the candidate mechanisms discussed above map onto existing treatment approaches; others suggest novel treatment strategies. How could these be identified, in individual patients, with existing or emerging techniques? As all of the pathophysiological mechanisms discussed above eventually lead to changes in network function, measures of brain connectivity are of central importance. 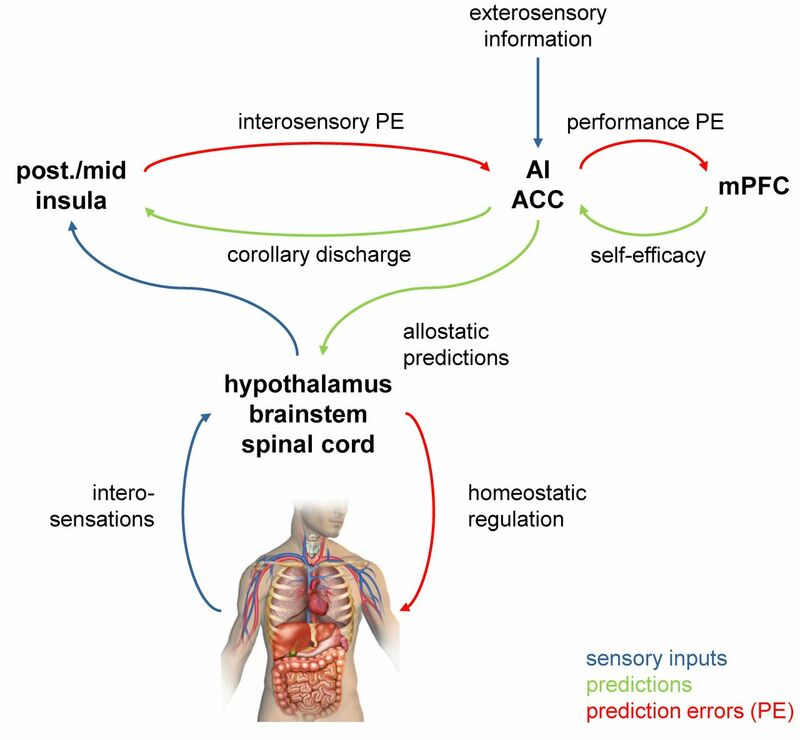 In the domain of fMRI, methodological developments have enabled a transition from simple estimates of undirected coupling (functional connectivity) to model-based measures of directed influences between neuronal populations (effective connectivity). The latter have become increasingly sophisticated—with an ability to resolve neuronal versus haemodynamic contributions to layer-wise fMRI signals and characterising transient modulatory influences122—and are increasingly used in translational neuroimaging.123 Furthermore, recent developments allow for computationally efficient whole-brain estimates of effective connectivity,124 which is important for diseases with distributed pathology as MS. In conjunction with high-resolution fMRI, models of effective connectivity could probe specific candidate mechanisms of fatigue in individual patients, with implications for treatment choice. For example, occult dysfunction of specific nuclei—say through inflammation-induced reduction of monoaminergic transmitter synthesis in brainstem nuclei or of orexin in lateral hypothalamus—could be inferred by assessing efferent connexion strengths of the corresponding nuclei to known target regions (or across the whole brain). For assays of monoaminergic nuclei, this approach could be further enhanced by computational models of transmitter release, respectively.125 If abnormal connectivity of specific nuclei can be established (eg, in comparison with reference distributions), this may predict beneficial therapeutic effects of stimulants (modafinil) or selective serotonin reuptake inhibitors/selective norepinephrine reuptake inhibitors. Similarly, estimates of effective connectivity between areas involved in interoception, homeostatic control and metacognition could help identify patients in whom fatigue results from a metacognitive diagnosis of helplessness with regard to overcoming dyshomeostasis (compare figure 3). This could be combined with inflammation-sensitive MRI sequences82 and designed perturbations of interoceptive and homeostatic processes16 to detect abnormalities in key circuit components frequently affected by inflammation and lesions in MS.19 62 If investigations of this sort point to a metacognitive/interoceptive origin of fatigue, this may predict therapeutic efficacy of MBCT126 or related forms of contemplative training with a focus on interoception. Despite its frequency and pronounced impact on the lives of patients with MS, techniques for differential diagnosis of fatigue and mechanism-guided treatment selection in individual patients do not exist. A critical basis for developing such methods are pathophysiological theories about the mechanisms of fatigue. This paper has reviewed contemporary theories about four major classes of disease mechanisms leading to fatigue: structural damage of WM/GM, inflammatory processes, maladaptive network recruitment during task performance and metacognitive interpretations of brain states that suggest ‘helplessness’. We anticipate that these theories together with recent advances in high-resolution functional neuroimaging and computational modelling will guide the development of tools for differential diagnosis. Similar to ongoing efforts in psychiatry,123 computational neuroimaging tools may provide indices of different causes of fatigue that support treatment decisions in individual patients. This represents an exciting and promising endeavour, but will require prospective patient studies for validating the clinical use of candidate tools. We gratefully acknowledge support by the Wilhelm-Schulthess Foundation, René and Susanne Braginsky Foundation, the University of Zurich and the Clinical Research Priority Program Multiple Sclerosis from the University of Zurich and the University Hospital of Zurich.
. Computational neuroimaging strategies for single patient predictions. Neuroimage 2017;145:180–99. Contributors Z-MM and KES performed the literature search, selected the relevant articles, wrote the paper and led the discussion. NAH, HDC, CTD, GS, NW, AL and AM added further references, contributed to the discussion and edited the paper.